News: Adidas has become the latest brand to launch a smartwatch with the release of a device for runners that monitors performance and gives coaching tips (as well as telling the time). 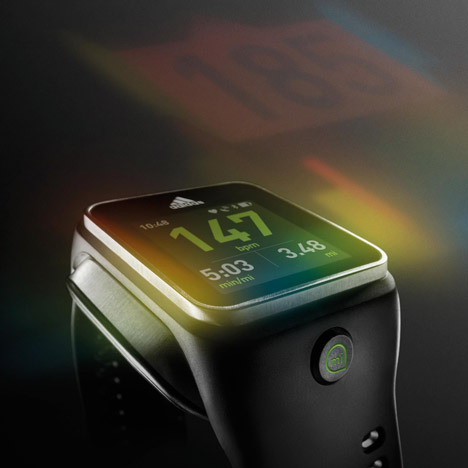 The miCoach Smart Run is Adidas' colour touch-screen running watch, which integrates both performance tracking and personal training into one device. "By combining the latest innovations, design and ease-of-use navigation, we consciously broke the template that defines other running watches," said director of miCoach at Adidas Simon Drabble. While training, users can track runs with GPS mapping, monitor heart rate, play music and get real-time coaching. A built-in accelerometer counts steps for tracking stride rate. GPS tracks speed and distance, mapping the route travelled on the journey. An integrated Bluetooth MP3 player can transmit music to wireless earpieces to eliminate headphone cables, which can become tangled while running. The watch also features a personal training application that uses colours and vibrations to tell the user to speed up, slow down or pause. Coaching can be delivered by a voice via a Bluetooth headset, plus animations demonstrating exercises and workout routines can be played on screen. "The visual and audible guidance for interval training is a leap forward from any other watch available," said Terrence Mahon, lead endurance coach for the UK Athletics Federation. The Smart Run watch will be available on the Adidas website from 1 November. Similar activity-tracking devices have been created by Nike and Jawbone, although neither feature screens. Dezeen editor-in-chief Marcus Fairs discussed how wearable technology will "transform our understanding of ourselves" in his Opinion column, published March this year. Companies from technology giants to car brands have all released wearable technologies over the past year. Adidas' smartwatch joins a model by auto brand Nissan that communicates with a vehicle, Samsung's Galaxy Gear that connects with the brand's other devices and the Pebble watch, which raised the most money ever on crowd-funding platform Kickstarter. Apple are also rumoured to be working on a smartwatch, while two companies launched rival Android-powered designs at the Baselworld watch fair in Switzerland in April.